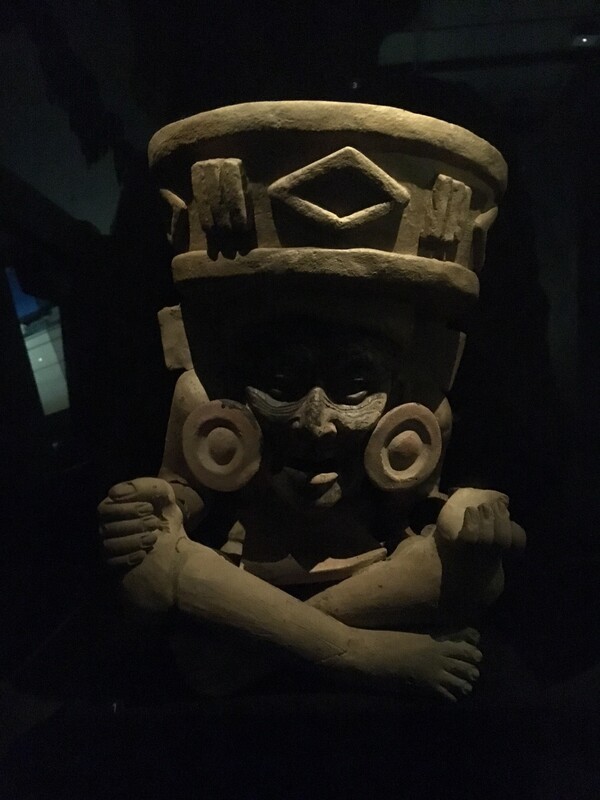 A perfect example of a fascinating object that most visitors to HMNS don’t see, this ceramic figure of Huehueteotl is of Classic Veracruz origin. The Classic Veracruz Culture existed from roughly 100-1000 AD and is largely unknown to the general public because it is overshadowed by contemporaneous cultures like that of Teotihuacan and later the Toltecs. Huehueteotl was important to cultures throughout Central Mexico. He was a fire god and was thought to reside at the center of the universe where he maintained balance between the different planes of reality and controlled time. He is often depicted as above, an old man, toothless and with a wrinkled face hunched over and supporting a large brazier. Heuheuteotl is one of the oldest deities in Mesoamerica, his image has been discovered at Cuicuilco, a city that flourished 2,500 years ago and is considered one of the earliest urban centers in the New World. He was greatly revered by the Aztec because of his associations with their legendary predecessors, the Teotihuacan and Toltec cultures. The image of Huehueteotl pictured above, considering its size and the quality of its construction, was most likely meant for worship. There is little doubt that a thousand years ago people were praying and possibly doing much more to the little statue that now resides in a dark corner in our McGovern Hall of the Americas. We know that the Aztec sacrificed people in honor of the god. Because of Huehueteotl’s association with fire, his victims were burned, sometimes while alive, other times while already dead. I love this piece. I am glad you did this piece on it.